I recently received a review copy of Michael Devine's An Invitation to the Garden, a cookbook featuring seasonal menus utilizing an array of freshly grown ingredients. 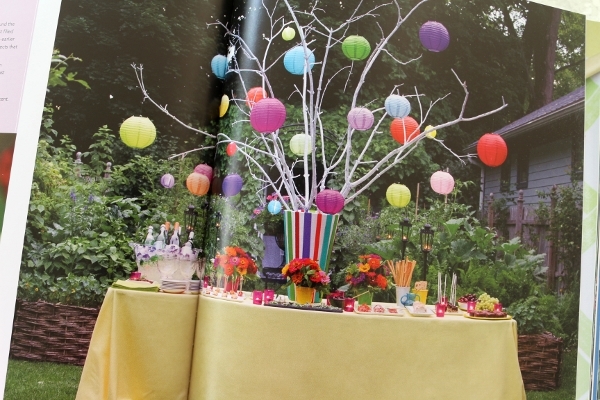 Devine is a master at garden entertaining. He has a bagatelle (really, it's a fancy shed) that he uses for outdoor-ish entertaining throughout the year, even when it's not quite warm enough to set up a table out in the garden. In our own way, my family has an outdoor enclosed patio and with the help of a space heater we can eat out there year-round if we like. In the summer, my dad's gorgeous roses line the perimeter of the backyard along with several plots for growing fresh vegetables and herbs. I don't have much of a green thumb (I once killed a cactus), but thanks to my dad I have access to fresh tomatoes, cucumbers, peppers, eggplants, potatoes, chard, and so much more every summer. I enjoyed reading through An Invitation to the Garden, and liked that many of Devine's tips in the book are not just for recipe cookery, but more for gardening and entertaining ideas. 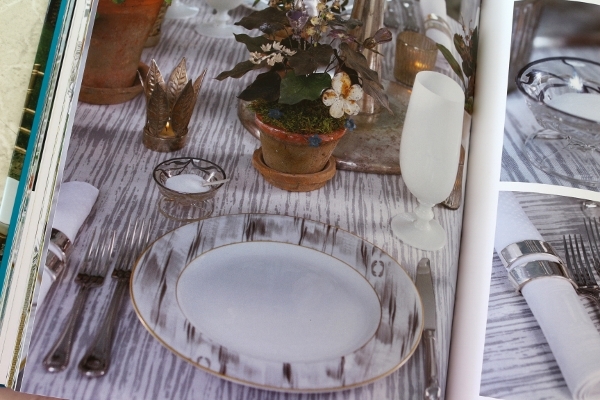 His tablescapes are lovely and I really enjoyed his menu ideas as well. What I like most is the seasonality of the dishes. Although I received this cookbook months ago, I waited to review it until I had access to more of the seasonal ingredients featured in the book, so I could really do them justice. Menus range from a Lilac Brunch in the spring to a Light Lobster Lunch in the summer, and continue on to an Early Winter Dinner. One of the things I love most about dining in the enclosed patio in the winter is turning on the spotlights outside and watching the snow fall. Bringing a bit of the outdoors inside. Selecting recipes to attempt from the book was as challenging as ever. I bookmarked several that span the various seasons featured in the book. In the end it came down to whatever I was craving most when I cracked the book open, ready to get cooking. The Chilled Terrine of Summer Vegetables fits the bill. 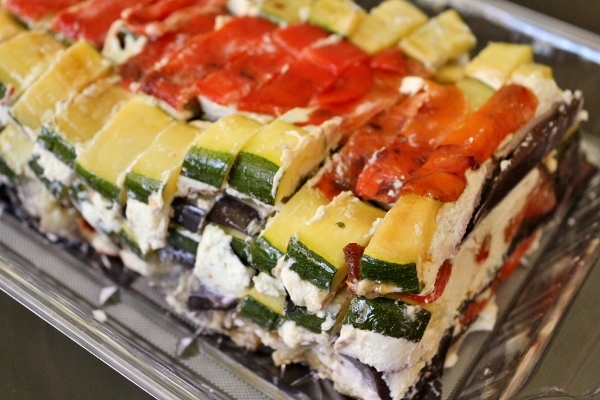 Containing roasted red peppers, zucchini, eggplant, sun-dried tomatoes, basil and goat cheese, this terrine truly boasts the flavors of summer. It's easy to prepare, but yields an impressive result that is perfect for entertaining, whether in your garden or on a boat. In my particular case, I created this terrine as part of a meal we enjoyed Forth of July weekend on my aunt's boat, sailing to Potter's Cove on Prudence Island, RI. Is there anything more summery than that? I don't think so. 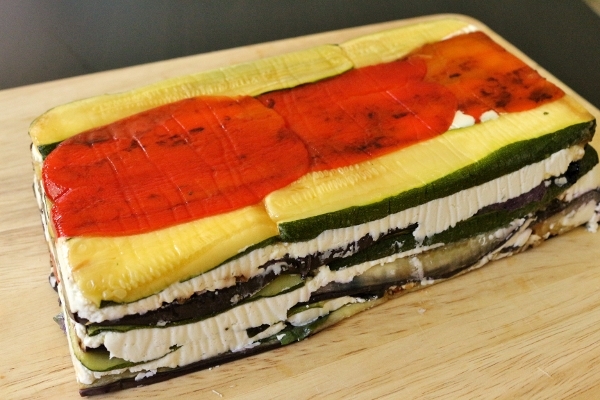 The flavors and colors of this lovely layered dish perfectly reflect those of summer. Each of the vegetables shine through this lovely composed dish, and the goat cheese is the most delicious glue to hold it all together. My family was very impressed with this dish, which I pre-sliced and reassembled before bringing it aboard (to make it easier to serve). I also sliced it into much thinner slices to yield more servings, but it would actually be easier and less messy to slice it more thickly. I suggest gently slicing with a serrated knife, such as a bread knife. 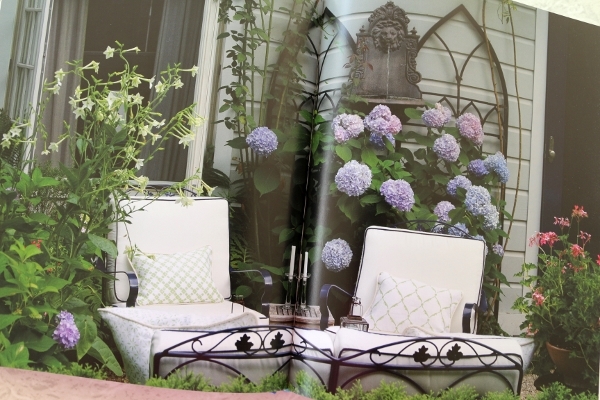 I look forward to trying other recipes from An Invitation to the Garden, and I love the gorgeous photographs. 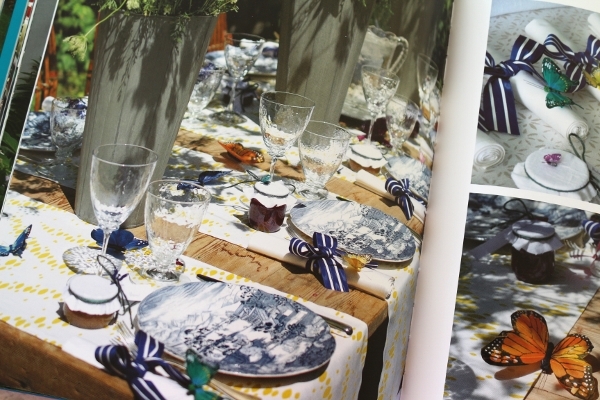 Not everyone would likely be able to host garden parties (many people don't even have gardens) but the point of the book is to enjoy the nature around you (and in your back yard) and cook seasonally, two things I can definitely get behind! Line a 9-by-5-inch loaf pan with parchment paper, leaving a 4-inch overhang on all sides. Line two broiler pans or baking sheets with foil. Pour 1/4 cup of the olive oil into a small bowl. Brush the peppers with the oil and place them on a lined broiler pan, skin side up. Broil for 5 to 10 minutes, until the skin is blackened and begins to flake. Remove the pan from the broiler and let the peppers cool slightly in a plastic bag (the steam will make it easier to peel). Peel the skins and set the peppers aside. 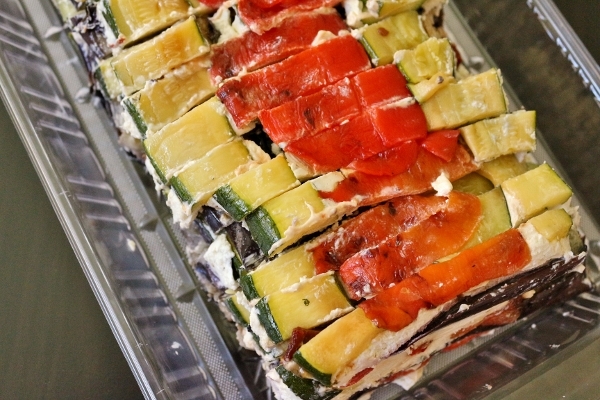 Brush both sides of the zucchini and eggplant slices with oil and place them on a clean, lined broiler pan (you may need to do this in two batches). Broil for 3 minutes on each side, or until the vegetables are tender. Remove the pan from the broiler and set the vegetables slices aside on paper towels to drain. In a food processor fitted with a blade, pulse the goat cheese, season with the salt and pepper to taste, and drizzle in the remaining 3 tablespoons of oil. Pulse until smooth and creamy. 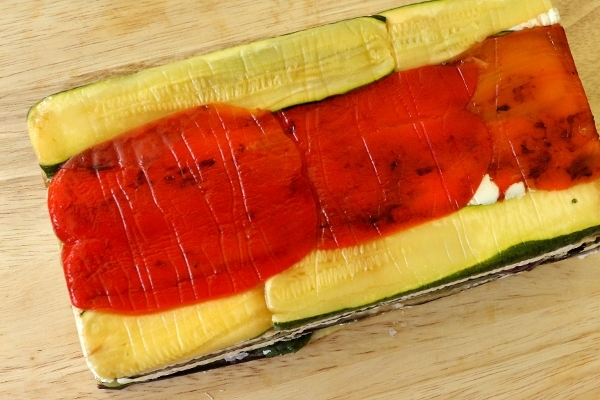 In the prepared loaf pan, arrange bell peppers down the center and then top with a layer of zucchini slices, trimming as necessary to fit. 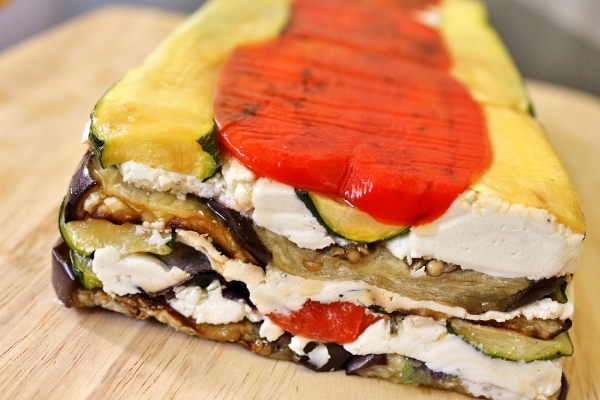 Spread one-third of the goat cheese mixture evenly over the zucchini layer. Top that with a layer of basil leaves. Next scatter one-third of the sun-dried tomatoes on top of the basil. 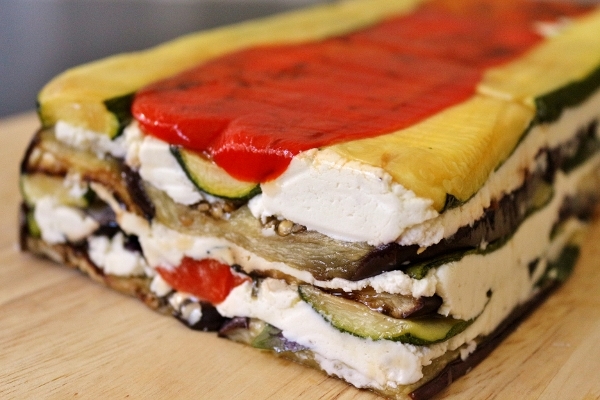 Arrange one-third of the eggplant strips in a single layer on top. Repeat these layers two more times, ending with the eggplant layer (adjust the layers as needed to use up your vegetables; I ran out of zucchini faster than eggplant and started putting the zucchini on the sides of the pepper instead of a full layer on top of it). Gently press down on the terrine to merge the layers and cover it with the overhanging parchment paper. Place a weight of some kind (I used small espresso plates with something heavy on top of them) on top of the pan to help press the layers together. Refrigerate the terrine for 6 to 24 hours. 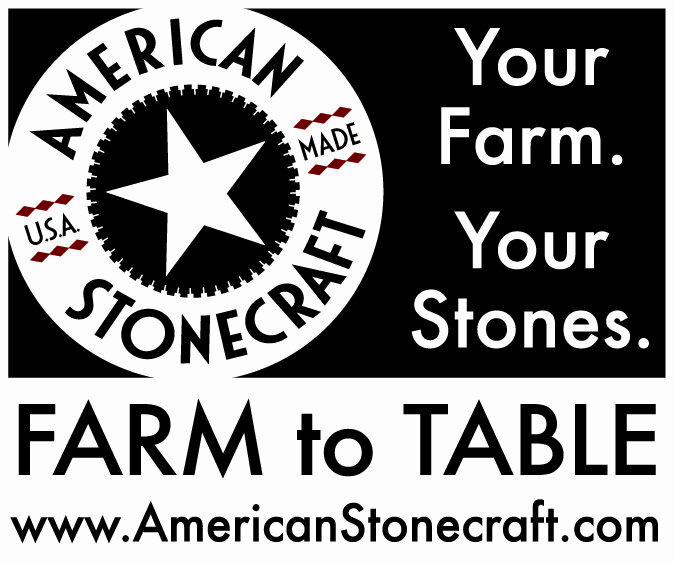 Unwrap, invert onto a serving platter or cutting board, remove the paper, slice with a serrated knife, and serve. *Disclaimer* I received no compensation to write this review other than a free copy of the book. My opinions are always my own.